I swear my phone came installed with some sort of magic kid alert, because it doesn't matter who I call or who calls me or how important the phone conversation is, the kids magically appear in front of me as soon as the phone is activated. I do my best to ignore the tattling/running commentary/begging by walking away and shutting doors, but they always find me. Always. It was very refreshing to learn that I am not alone in this. That is, not alone in the ignoring of my children while I am trying to have a phone conversation. I laughed so hard at Jane Isfeld Still's Bombeckian commentary about her own phone and her own children that I cried. And that isn't the only story I laughed at. 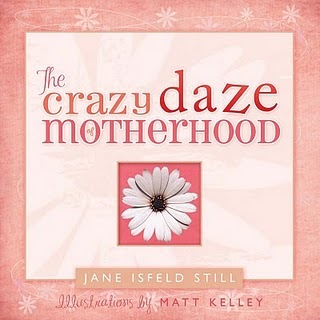 Jane's new book, The Crazy Daze of Motherhood is hilarious. It's one of those cute little books that packs a great big punch. Not only is it laugh-out-loud, tear-jerking funny, it helped me feel a little more normal in my own mothering adventures. I haven't had a good sense of humor about them recently, I must admit, but after reading this book I realized that it's always better to laugh. Take yesterday. Let's just say that I had lots of plans for yesterday which included things like taking a shower and scouring my house. But I was foiled time and time again by things like a clogged toilet, a goose egg on the head (not mine) and a vomiting child. I just had to laugh, clean up the messes and forget about washing my hair or the dishes. So thanks to Jane for the much-needed dose of perspective. This book would make a great Mother's Day gift for any of your friends who would enjoy a good laugh at the expense of motherhood. And who wouldn't enjoy it? And you know? Aside from a funny book, what mother doesn't want chocolate? You are right about the chocolate~! And the nagging kids during phone calls! And, especially about not accomplishing what I set out to do around the house. I DO need to read that book! I'm a newbie on this here blog and I love the font and the cuteness of this blog! This book also sounds really neat. Though I am not a mother of any children (unless you count cats) my sister is new to motherhood and I think I should order it for her! She'd love it! Isn't it so true about the phone? And if I even dare get on my laptop Chloee is all over me! The book sounds fun, but I am in denial about being a mother to a little one again. I might need to look into for my sons fiance though! I seriously cannot comprehend the bizarre phenomenon of my children instantly vaporizing from some unknown part of the house to right in front of me as soon as I'm talking on the phone... it drives me BONKERS!